The voting ended on 3/12 at 10am and design 10 was in 1st place. Mayors design was in 3rd at this time. He didnt take the lead till after the contest was over. 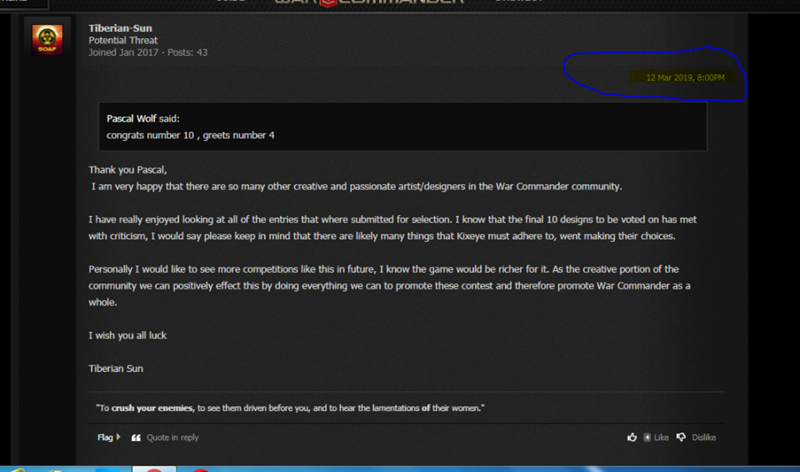 Why would kixeye let this happen when true winner was Tiberian sun or number 10. You cant count votes after the posted end date. Everyone stopped voting because the contest was over allowing mayors design to take the lead. It certainly looks fishy that after 10 days of voting that held the warskin design leaderboard pretty constant, suddenly the third place contestant gets a huge flood of votes. I can think of a few explanations: Someone hacked the numbers. Someone used a bunch of fake accounts. Kixeye people voted in and swung the vote. Or the winner lobbied a ton of friends and clan members to vote at the last minute.